As stated above, Montezuma II (c. 1460–1520), ninth Aztec emperor, was the first person of importance to fully appreciate the beauty of the Cuetlaxochitl. The local Mexica (Aztec) named their flower, whose white, sticky sap provided them with a cure for fever and flowers a source of red and purple dye. In 1824, Pointsett, "during his stay in Mexico as the American Ambassador, wandered the countryside looking for Mexican plants that he had never seen. While walking down a road, he came across someone's large plant growing on the corner of their property." He took a cutting from the plant, shipped it home to South Carolina and grew it in his greenhouse. Renamed for him, the rest is history. Obviously, as it was the custom since 1492, the arriving foreigner who "found" an Amerindian object, had the privilege of either renaming it or being credited with being the "founder". So the Cuetlaxochitl became the Poinsettia. 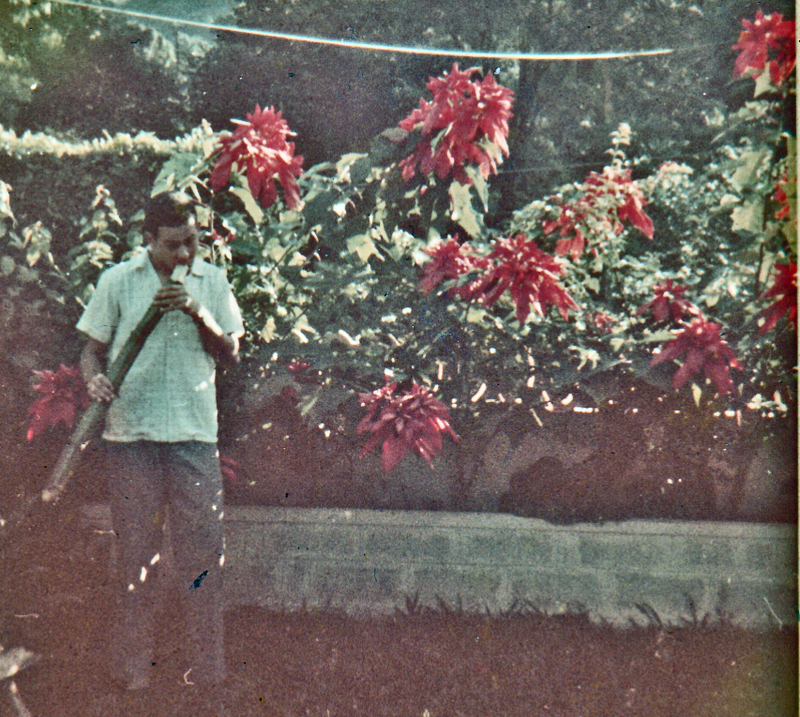 Back in Jamaica for the Christmas break of 1963 after my first year at a DC university... First thing. 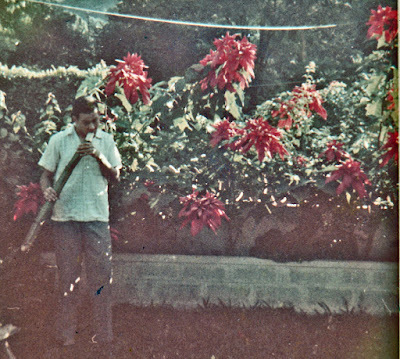 Grab some sweet sugarcane, hang out on the front lawn next to the Poinsettia that my dad had planted the year before. The Christmas Season has prescribed traditions. However, one Aztec Emperor's love for a local flower became an American annual obsession. Enjoy the entire SEASON that the flower blooms! The impact of the Caribbean on the Eastern hemisphere after 1492 was more extensive than has been reported. Many tropical foods like the Taíno anona became the welcoming Colonial American symbol as the “pineapple”. It was traditionally placed above a Kalinago (Carib) door jam for the same purpose. Brought into Williamsburg, VA, a major capital of the British U.S. Pineapples were brought in by sea captains arriving from Europe via the Caribbean. 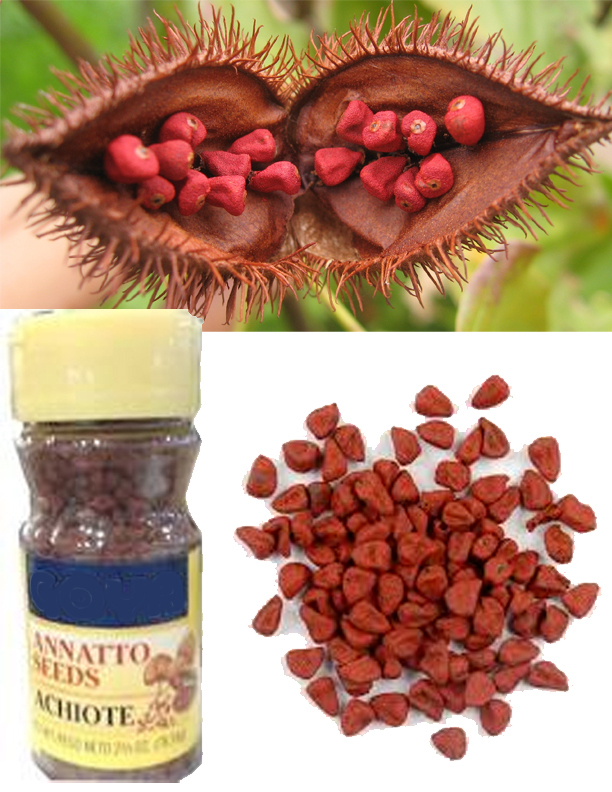 On some large dinners, the exotic complex fruit was rented out as a centerpiece on lavishly laid out tables. Impressions of “The Indies” on European writers is even less known. Of note, the First was the Spanish novelist Garci Rodríguez de Montalvo who was a Castilian author who published “Sergas de Esplandián”. The first published novel with Taíno influences. Based on a Taíno epic recorded by Fr. Ramón Pané in 1498 (in "Report about the antiquities of the Indians"). California takes its name from de Montalvo’s novel and the ruler of the mythological Island’s Queen Calafia, who was the “black”, virginal Amazon ruler of La California. It is widely thought that Calafia, which derived from the Latin calipha, was taken from the Arabic khalīf. Sergas de Esplandián’s Island of La California was populated by amazons whose only metal was gold. 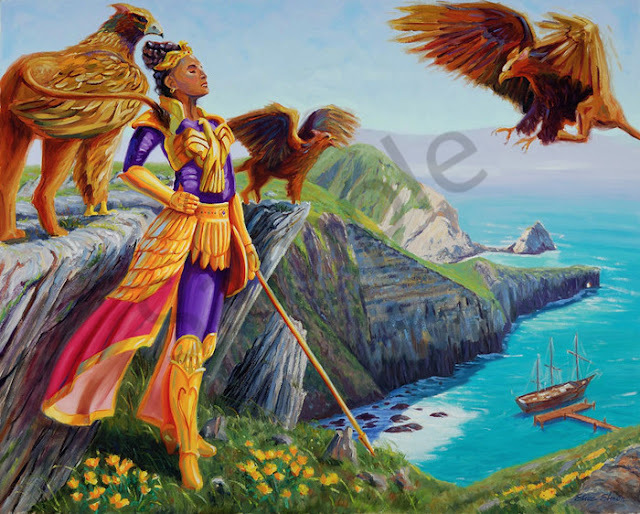 The combined source of this “Island of Women” and one of Gold seemed to have come from the Taíno epic hero Guahayona and his travels to Matanino(the Island of Women) and his continued travel on to Guanin (the Island of Gold). One Taíno word and their reported personality were influential on the Ehglish playwright William Shakespeare and the novelist Daniel DeFoe. Etching of a concept for Caliban. This is how the play portrayed a major character in Shakespeare's "Tempest". It is an illustration for the English audience's concept of a Caribbean Amerindian. Above: Two English interpretations of Caliban. 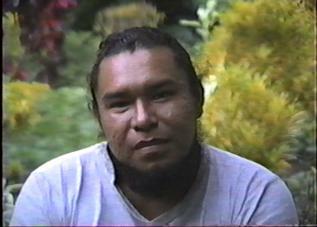 Below: Photograph of an actor's portrayal of Caliban as a Kalinago (Carib Anerindian) from the Eastern Caribbean. What has changed? 1. The ugly, beastlike slave of Prospero in Shakespear's The Tempest. 2. One of the most examined and controversial characters in the 1611 play "The Tempest" attributed to William Shakespear. Probably from caribal, caribales, canibales, a European word for the Island Carib of the Caribbean. 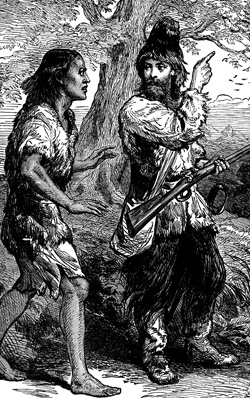 Illustration of Friday, Robinson Crusoe's Amerindian companion. 1. The sixth day of the week derived from Frig (“to copulate”), or Fria (Fria’s Day), the Germanic goddess of love. 2. A character from Daniel Defoe's 1719 novel The Life and Times of Robinson Crusoe. 3. Name given by Robinson Crusoe to his devoted male servant/companion. 4. A devoted male servant, aid or employee, especially having a high degree of responsibility. The Spanish sponsored voyages to the Americas by Italian adventurer Christopher Columbus, had long lasting repercussions on both sides of the Atlantic Ocean. Initial encounters, like most first impressions, were often incorrect and caused irreparable damage to the indigenous peoples of the Americas. Amerindian stereotypes have lasted throughout the ensuing centuries. For example, it is not unusual for the words "Red Indian" to be used to refer to people who were neither "red" nor "Indian". 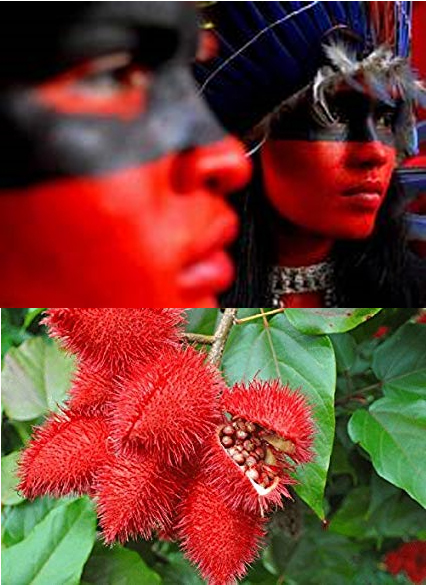 Red, from the annatto, or achiote pod, was one of the colors used to protect and adorn the skin of the Tainos and Caribs. "Indio" was a misapplication by Columbus who, for personal reasons, insisted that he had arrived at islands off the coast of India. Centuries of neglect and guilt by the emigres to the hemisphere have made indigenous people the least understood communities throughout the Americas. Indigenous peoples of the Americas were composed of many ethnic groups which had a wide range of body types, skin colors, languages, and customs. Although Native Americans are genetically close to some "Asiatic" peoples they were not what Western Europeans thought them to be. First written impressions of the Tainos and Caribs came from Christopher Columbus's log of the voyages and letters to his royal backers. Ensuing 15th and 16th century debates about who these people of the Indies where and what were their origins have continued into our century. Writers have either romanticized or defamed them. An example of early attitudes towards indigenous Americans can be seen in The Tempest. Although the authorship of The Tempest by William Shakespear has been questioned, this play is thought to have demeaned Amerindians. Another author, Daniel Defoe, in The Life and Times of Robinson Crusoe, presented the character Friday as a noble savage and his pursuers as American cannibals. The 1611 play, The Tempest , was based on a real life British shipwreck of the Sea Venture in the Caribbean in 1609. The ship was wrecked by a Caribbean hurricane while on its way to the new British North American colony of Virginia . The word "tempest" was the English term for "storm". In 1611 the word "hurricane"
(from the Taino hurakan ) had not yet entered the English language. In The Tempest the main characters were Prospero (the European magician) and his virtuous daughter Miranda . They were shipwrecked and marooned on an island inhabited by the creature, Caliban. Caliban was characterized as a vile and inhuman being. Prospero seized the island and enslaved Caliban (a typical mindset of the period) who came to be despised by the magician. Prospero's superior intellect failed to civilize or humanize Caliban. This curious creature was probably created around popular 17th century rumors about the Island Caribs who Columbus’ men in 1493, had maligned as cannibalistic ( a Kalinago tradition of keeping the bones of revered ancestors in hanging baskets inside the home). Some Shakespearean experts believe that Caliban is derived from the early variation of the words Caribal, Cannibal, Caniba or Carib, from the Taíno “strong men.”. The Island Carib call themselves “Kalinago”. In colonial Virginia the British were so wary of the Carib's war-like reputation in the Caribbean that they passed a law in the House of Burgess to hang every Carib who was brought to the colony. The Tempest also revealed the prevailing ethnocentric and paternalistic attitudes towards the Caribs. These were common traits exhibited by Europeans towards the indigenous populations in the early forays into the Americas. The British playwright described Caliban as a "weak and deformed slave". Because of his plight Caliban was misidentified in some plays as African or Asian, who themselves were later subjugated by the British Empire. In later centuries many colonized or subjugated peoples identified with Caliban's dilemma. Daniel Defoe also based two stories on an actual marooning of a Scottish sailor on the Juan Fernandez Islands off the shore of Chile. In 1704 Alexander Selkirk had a dispute with the captain of the pirate ship on which he was the first mate. Selkirk requested to be put off on the island and was later rescued by anothter English pirate ship in 1709. Defoe's famous stories which were based in this incident were "Treasure Island" and "The Life and Times of Robinson Crusoe". Marooned on a tropical island after a shipwreck Defoe's character, Robinson Crusoe, came across some human tracks on the beach. The footprints turned out to be those of another human being who Crusoe named "Friday". Both Treasure Island and The Life and Times of Robinson Crusoe are envisioned as Caribbean tales. Notorious pirates and shipwrecks by hurricanes were part of the early history of this geographic area. British pirates of the Caribbean were also called buccaneers and often with the clandestine approval of the monarchy, harassed the Spanish in the Americas at will. Buccaneers began on an island off the coast of Haiti (Hispaniola). They were French woodcutters employed by the Spanish to harvest exotic Caribbean woods for export to Spain. Expelled from Hispaniola, they set up barbecoa shops on an Island. The French called the barbecue grill a “bucan”. They were called “bucaneers”, men who sold barbecue pork and beef to passing ships. Soon, they began to rob their customers and became roving “buccaneers”. The turbulent Caribbean was not Defoe's source for his stories and some writers believe that Friday could have been an Inca man escaping the allegedly "cannibalistic" Puna Islanders. During Defoe's time prevailing attitudes towards the indigenous people of the Caribbean makes it more probable that the character, Friday, was visualized as Taíno and his pursuers were conceived as "cannibalistic" Caribs. At first, the Caribbean’s idyllic location, its exotic Amerindian people, its imaginative mythology had made an indelible impact on the Eastern Hemisphere. Soon, it also tapped into the deepest fears of homeland Europeans who were already primed with their own macabre tales. They sometimes believed that local tales like The Eternal Fountain of Youth (a type of Medieval Viagra) was realized in the Caribbean. “Las Siete Ciudades de Cibola” became the “Seven Cities of Gold”, believed to be located in New Mexico’s Zuni territory. The pursuit of these myths caused the deaths of many Amerindians and Spanish adventurers. The initial greed was fueled by a drive was a thirst for women and gold. The high percentage of mestizos and tons of gold and other treasures taken out of the Americas. Case in point: Hernan Cortez's belief in Garci Rodríguez's popular novel, Sergas de Esplandián , is revealed in his actions below. Descendants of the people who were maligned by Columbus' reports and Shakespeare's play live in Dominica, Eastern Caribbean..
Center Top: Chief Irvince Auguiste. Bottom, Left: Hermine, 7th grader. Bottom, Middle: Filex Francis, basket-maker. Bottom, Right: Napoleon Sanford, traditional canoe-maker.